A rendering of Moodie Station in the second phase of Ottawa's LRT system. Photo via Jim Watson on Twitter. This story was updated with information about the project's expected higher costs. City officials have revealed their top picks of the construction and engineering giants to expand Ottawa’s light-rail network further west, east and south. In a briefing Friday afternoon, the city announced its preferred proponents for the two massive infrastructure contracts. A consortium dubbed “East West Connectors” – led by Nebraska-based construction engineering firm Kiewit and French infrastructure giant Vinci – will extend the Confederation Line to Moodie Drive in the west and Trim Road in the east. 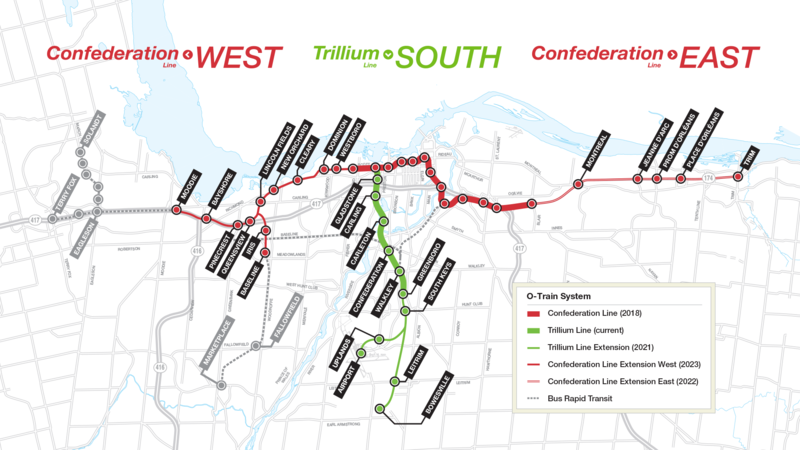 TransitNEXT – a subsidiary of Montreal-based SNC-Lavalin, which is already a member of the Rideau Transit Group consortium developing the LRT’s first east-west phase – will extend the existing north-south Trillium Line to Riverside South and the Ottawa International Airport. The selection of SNC-Lavalin is already raising eyebrows, as the firm is currently at the centre of a political controversy over fraud and corruption charges that could ultimately see it barred from bidding on federal contracts for a decade. Mayor Jim Watson said on Twitter that the second phase of light rail would be completed by 2025. That’s two years later than initially planned. The price tag has also ballooned based on the increased scope of the project and higher “market conditions,” city staff said in Friday’s presentation. Phase two was last costed out at $3.6 billion a year ago, but the latest budget estimates a price of $4.657 billion, all told. Roughly $1.6 billion of that cost is expected to come in the form of debt with the rest covered with cash and government grants, according to city official’s breakdowns. The federal and provincial governments are expected to collectively kick in some $2.3 billion to the project, though Ontario’s Progressive Conservative government has yet to officially commit its $1.2-billion share of the funds. Once complete, Ottawa’s total rail network will span some 64 kilometres and include 41 stations, Watson said. A timeline presented Friday afternoon projected construction on the extension could begin as early as this summer.